Germany opposition party, di Social Democratic Party (SPD) don reach agreement to form coalition government with Chancellor Angela Merkel centre-right (CDU/CSU). Dis agreement delay until now because di two parties dey drag who go dey in charge of some major ministries. Dis agreement go end months of fight-fight since di German election for September last year. Na since Tuesday morning negotiators don lock diasef inside room, knack head together to find solution and as e be so, e be like say new government fit begin run things by Easter. As things dey ground, di main opposition party, SPD fit control six ministries wey go include finance and foreign affairs. German media dey talk say party leader, Martin Schulz, dey eye di foreign minister job for imself. But dis agreement go still need di final green light of di SPD 460,000 members, wey go vote in few weeks time. One group inside di SPD wey dey call diasef, NoGroKo, don talk say dem no wan make SPD follow di CDU/CSU do coalition. 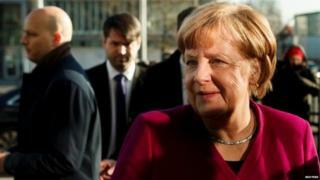 Germany: Wetin make Merkel 'market' still dey sell?